AWDGuy: Acknowledged! Good luck with the rebuild, whichever option you select. It is an eye opener for me as well as to how much those fasteners add up to rebuild an engine. One understands better why Jake charges that much for his engine work, expertise and final product. As Creekman suggests, I had mine checked for leaks (none found), emptied (as I was not sure what was used by a previous owner) and recharged early this summer with R134A at a VW dealer. Too easy and lots of cold air now! AWDGuy; You seem to be between a rock and a hard place at this time having followed your other thread on Rennlist and previously here. I believe Jake has taught a few of his classes in Canada so he might have someone that attended one of his classes that he would suggest to do this rebuild if you decide to go back to that option given the lack of documentation for such a finicky job. Last year, I had asked him about his best student in the Vancouver area and he recommended (was extremely impressed with) someone in Richmond (near Vancouver airport). I have not gone ahead yet with what I want to do but even today this shop was mentioned on Rennlist Canada as being most excellent for engine work. I understand Vancouver is a bit far from Ottawa but there might be someone in the Toronto area he would recommend if he had one of his classes there in the past. Bonne chance ... and for what it's worth, we are pulling for ya! Kim: Do you still have a picture of what you old one looked like? 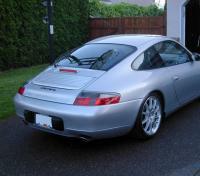 I could do a comparison with the graphite grey I have in my 2000. I second that or simply one picture of both consoles side by each in the car. My console is in sad shape as well (graphite grey). Thanks j_beede! Expert advice appreciated! But keep reporting those breaks, Creekman! We kinda like that about you! :thumbup: Cheers! Wow! Thanks for sharing this nugget of deviousness, JFP. Forewarned, indeed! Good point! I meant 'fore-armed' from a buyer standpoint whereby, I would likely opt for an 06 rather than an 05 to stay away from the IMS unknown risk parameter. With respect to your last question as a seller, I would not agree to go as far as pulling the T-mission but I would be honest enough to tell the purchaser about which type of engine the car has: original, refurb such as AT, etc ... to the best of my knowledge. Thanks J-F! So the hard lesson is 05,s can't really be trusted IMS-wise, even 'S's ... and watch that AT or austauschmotor designation, which will likely mean it did receive a larger single-row IMS during that replacement build or rebuild. Forewarned is fore-armed as a potential 997 buyer!